In July 1942, the world was at war. America had just lost 800,000 tons of her supply ships to German U-boats. Henry Kaiser, famed industrialist and builder of “Liberty” ships, proposed a fleet of flying transports to safely move troops and materiel across the Atlantic. Kaiser approached Howard Hughes with his idea. Together they formed the Hughes Kaiser Corporation and obtained an $18,000,000 government contract to construct three flying boats. Hughes and his team of skilled engineers designed a single hull flying boat capable of carrying 750 troops. The plans called for eight 3,000 horsepower engines, a mammoth fuel storage and supply system, and wings 20 feet longer than a football field. The aircraft was dubbed the HK-1, standing for the Hughes Kaiser design number 1. Adhering to the government mandate not to use materials critical to the war effort (such as steel and aluminium), the Hughes team constructed the Flying Boat out of wood. Testing new concepts for large-scale hulls and control surfaces, plus the incorporation of complex power boost systems, delayed the construction process. In mid 1944, Henry Kaiser withdrew from the project, and Hughes renamed the seaplane H-4, representing his aircraft company’s fourth design. After the war’s end in 1945, criticism of the project mounted. The Flying Boat prototype had exceeded the government’s funding allowance and the U.S. Senate formed an investigation committee to probe alleged misappropriation of funds. Hughes invested $7,000,000 of his own money into the project to keep it going. Meanwhile, the Hughes team assembled the Flying Boat in the Long Beach dry dock. Wishing to vindicate himself after a being interrogated by the Senate committee in Washington, D.C., Hughes returned to California and immediately ordered the Flying Boat readied for taxi tests. On November 2, 1947, a crowd of expectant observers and newsmen gathered. With Hughes at the controls, the giant Flying Boat glided smoothly across a three-mile stretch of harbor. From 35 miles per hour, it cruised to 90 during the second taxi test when eager newsmen began filing their stories. 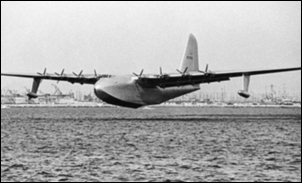 During the third taxi test, catching the media and crowd unaware, Hughes lowered the wing flaps and lifted the seaplane off the water flying her a little over a mile at an altitude of 70 feet for approximately one minute. The short hop proved to skeptics that the gigantic machine could, indeed, fly! The creation of the Hughes Flying Boat involved many engineering disciplines. Not only did mechanical engineers participate in the numerous aspects of the aircraft project, but their efforts ranged in breadth from the models constructed for wind tunnel evaluation and towing basin tests through to the final launching details of the completed seaplane. Mechanical engineering was involved in designing many elements of the Flying Boat: the jigs and fixtures for moulding the aircraft parts; the fire suppression systems; multiple hydraulic components such as flareless tubing fittings and slip joints; the fuel and oil tanks; the pumps and piping for the fuel and oil supplies; the oil cooling system; and the cockpit instrumentation—not to mention the design of the massive engines and full feathering propellers with reversing capability. The principal structural material used for the Hughes Flying Boat was birch veneer. Members were built up using several plies of thin veneer bonded together. When glued and steam heated, birch held up better than spruce, and it took the bolting stresses better. By laminating birch in multiple grain directions, the necessary grip for bolts proved practical. Birch was also superior in terms of weight reduction in high stress applications. Duramold, a lamination bonding process, was originally created for moulding parts for smaller aircraft. The contoured surfaces were very smooth and provided great aerodynamics. Originally developed by Fairchild Aircraft Company, Howard Hughes purchased the rights to use it in large aircraft. Because the pieces required were so big, and the materials for steel dies costly and in short supply, Hughes fabricated and experimented with “Gunite” dies. Gunite is a patented process for placing concrete mortar with compressed air. The Gunite process produced difficult shapes easily at a relatively low cost. Intensive research resulted in one of the earliest practical uses of epoxy resins. The main structural material for the huge craft was built up by bonding several plies of birch veneer with a ureaformaldehyde adhesive. In addition, some spruce, poplar, maple, and balsa were employed. Special corner angles were developed to replace glue blocks. Glue blocks were a serious problem for the aircraft builders because of differential expansion across and with the grain. Thousands (about eight tons) of small nails were used to provide pressure for attaching the hull and wing skin. After the adhesive had cured, they were removed with specially designed nail pullers. The result was an immense wooden airframe able to withstand the stresses of flight without being too heavy. The wooden construction made fire protection a high priority. The amount of fire protection equipment aboard the Flying Boat is impressive. A total of 36 carbon dioxide pressure containers are located on the cargo deck. They provided both primary and auxiliary fire control to the fourteen fuel tanks and to each of the eight engines. A complex manifold allowed the gas to be directed to the plane’s various areas as needed. If required, all 36 bottles could be discharged into one area for maximum effectiveness. Hughes and his team of engineers discarded the idea of using the conventional 24-volt direct current (D.C.) system for the aircraft, primarily because of weight, and designed a new 120-volt, three wire, redundant D.C. system, which brought about a weight reduction of 75 percent. Care also was taken to ensure that all the electrical relays would perform at high altitudes. Two 30-kilowatt generators provided backup electrical power, and emergency battery power consisted of ten 12-volt batteries in two banks. To attain a range of 3,000 miles, the Hughes Flying Boat was equipped with fourteen tanks, complete with baffles to minimize fuel sloshing. Each fuel tank had a 1,020-gallon capacity, but to allow for expansion, each was filled to only 900 gallons. Fuel was transferred from the tanks, located below the cargo deck, to two 300-gallon wing tanks. One wing tank fed the four inboard engines, and the other wing tank fed the four outboard. The Flying Boat was also equipped with an emergency fuel transfer and supply system in case of leakage or pump failure. Each of the seaplane’s eight engines had a 31-gallon oil lubricating tank. Each of these tanks was replenished from a central 281-gallon tank located in the rear of the flight deck. The oil supply system operated automatically with a float in each individual tank or manually. The oil piping in each engine nacelle consisted of a main engine-oil pipe, reserve-oil supply lines, vent lines and propeller-feathering piping. Carburettor inlet scoops were placed below each engine nacelle, and oil coolers were placed in the inlets, which were enclosed by the air-scoop fairings and temperature regulating doors. Each of the eight Pratt and Whitney Wasp Major R-4360 air-cooled radial engines drove a Hamilton Standard four-bladed, hydromatic, full-feather propeller measuring 17 feet 2 inches in diameter. The four inboard propellers could provide reverse thrust. The thrust reversing capability would assist the Flying Boat back off the beachhead after loading or unloading its cargo. Originally designed with four throttles (one for each pair of engines), after the flight Hughes changed the design to eight throttles, one for each individual engine. At first, all engines operated by Pneudyne’s pneumatic system, or compressed air in place of hydraulic fluid. However, it was difficult to control them precisely, and no two valves would operate the same with identical pressure. After the flight, Hughes had electric throttles installed, along with servos for throttle control on all eight engines, which gave them a response time of 1/300 of a second. Hughes and his team of engineers developed the first “artificial feel system” in the control yoke, which gave the pilot the feeling he was flying a smaller aircraft, but with a force multiplied many times. For example, for each pound of pressure exerted on the control yoke by the pilot, the elevator received 1,500 pounds of pressure to move it. 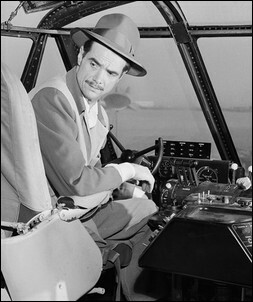 The Flying Boat required two auto-pilot systems but Howard Hughes’ passion for safety required five hydraulic control systems, which included two main systems, two auxiliary systems, a hand pump system, plus an emergency flying tab system in case of complete hydraulic failure. Conventional control cables directly connected cockpit controls to the control surfaces, however, they did not move the control surfaces. They only provided a follow-up to ensure the proper relationship between the pilot’s control positions and the actual deflections of the control surfaces. The Hughes engineers used electrically driven, high-pressure hydraulic pumps that provided Flying Boat assembly the operating power for the systems. When the pilot moved the controls, he actuated sensitive relay valves that transmitted metered, pressurized hydraulic fluid into tubing that led to receiving relay valves located at the control surfaces. The receiving valves in turn permitted pressurized oil to flow to the power cylinders, which actually moved the control surfaces. To ensure complete safety, each control surface was operated by two independent, self-contained telecontrol systems, which were supplied with electric power from two separate generators. The enormous control areas (ailerons, flaps, elevators and rudder) cover 4,414 square feet, and all are fabric covered except the flaps. The Flying Boat was the first aircraft to utilize flareless tubing connectors in the hydraulic lines. Fuel lines were equipped with “slip” joints and “floating” fairleads to allow for the deflection of the wings. The pilot and co-pilot’s cockpit flight controls are each equipped with a control column and wheel, pedal operated rudder control, and engine throttles between the two positions, plus essential engine and navigation instruments. A starboard-side flight engineer’s station is immediately behind the co-pilot’s seat and contains dials and gauges to monitor the eight engines, throttles, alarm annunciators, fuel indicators and hydraulic status gauges. A novel elevator equipped with guardrails, located in the rear of the flight deck, is designed to lift personnel through a top-opening hatch. Equipped with a microphone connected to the aircraft’s communications network, the personnel could supervise docking and mooring of the Flying Boat from a vantage point atop the fuselage. 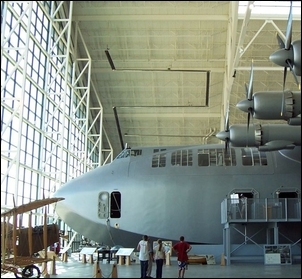 Now commonly called the “Spruce Goose,” the Hughes Flying Boat has endured to become a popular cultural icon of American history. She tells a story of wartime sacrifice, determination and technological development. She still is the largest wooden seaplane ever built, and she proved that jumbo flying aircraft and large lift capability were possible. She was decades ahead of her time in the early 1940s, Today, thanks to the many dedicated to her survival, she rests among other historic aircraft at the Evergreen Aviation Museum. *The Hughes Fyling Boat is an American Society of Mechanical Engineers (ASME) International Historic Engineering Landmark. The text of this story appears by agreement of the ASME. Go to http://www.asme.org/Communities/History/Landmarks/Howard_Hughes_Flying_Boat_HK1.cfm for more on this Landmark.